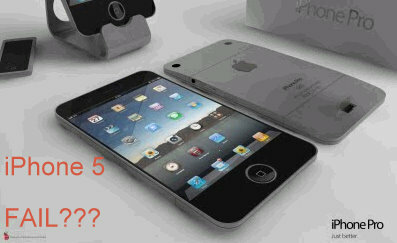 Will The iPhone 5 Actually Be A Flop? Anyway, news is out today that the iPhone 5 may only have a 3.5 – 3.7 inch display, as opposed to the previous rumored 4.0 – 4.2 inch display. If this is the case – if the iPhone 5 launches with only a 3.5 – 3.7 inch display we are talking about a device that is, screen size wise, somewhere along the lines of a bottom line smartphone. Back in 2007 when the iPhone first released, a 3.5 inch screen display was revolutionary and people thought they were looking at a laptop computer. But now, with smartphones being released that are pushing 4.5 inches, this makes the 3.5 inch iPhone seem…. well… sub par (IMHO). And especially considering the fact that the iPhone 5 is also suppose to have a thinner iPhone design, the thinner and smaller device will – I believe – turn off a lot of customers. This won’t be a good thing for Apple in the overall smartphone market space. And guarantee that if this is the case, if the iPhone 5 releases with a 3.5 – 3.7 inch display, competitors like Samsung and HTC will attack that like sharks who smell blood in the water.